Cut carrot into the size of matches. Cut beans in 1″ pieces.Blanch the cabbage. In a pan with a little water and salt, boil the vegetables for 5 minutes. Drain. Cut cucumber in *small* cubes. Peel scallions and garlic. Put in kitchen machine; cut to paste. Mix with sambal, kunjit and ginger. Heat oil in a frying pan. Fry the herb-mixture for 2 minutes. Add vinegar and sugar; stir to dissolve sugar. Add all vegetables (also the ones not cooked yet); add a *little* water if there is too little liquid. Boil softly for 2 minutes. Put in a bowl and let cool. You can also preserve it by putting the hot veggies in sterilized screw-lid jars (metal lids with a ‘dome’ in the middle are quite handy, add liquid as well. Screw the lids on. Place jars upside down until cooled completely (the ‘dome’ in the lid will be down, this is to check if the jar closed well). Can be kept for at least a year (store in dark place to avoid having the color goes away). Sambal ulek [INDONESIA]: Used as an accompaniment and in cooking. Made by crushing fresh red chilis with a little salt. Remove the seeds from the chilis, chop finely, then crush with salt using a pestle and mortar. Three chilis will make about 1 tablespoon sambal ulek. 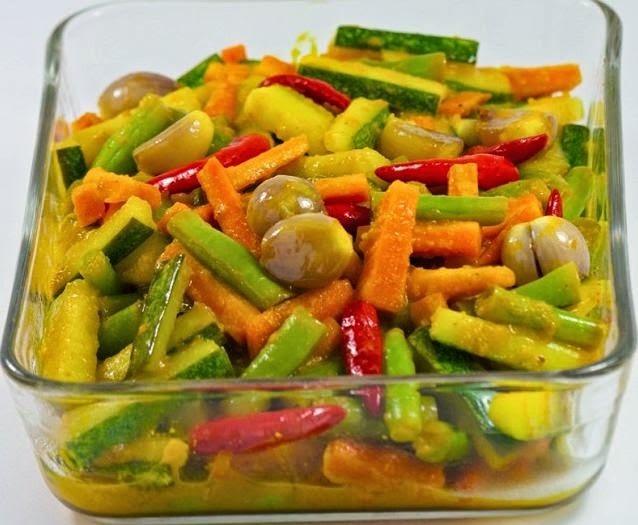 This is a refreshing side dish made of crisp, sweet-and-sour vegetables. Goes really well with Nasi Goreng. The dish can be kept in the fridge for a few days.